The working mode of serial WiFi shield includes AP and STA modes. When AP mode is chosen in WebServer, “refresh” and “AP List” buttons will be abandoned. However, SSID and Password may be set. If STA mode is chosen, “refresh” and “AP List” buttons will be enabled. “Refresh” may be used to scan other WiFi signal, and the scanned result will be shown in the “AP List”. 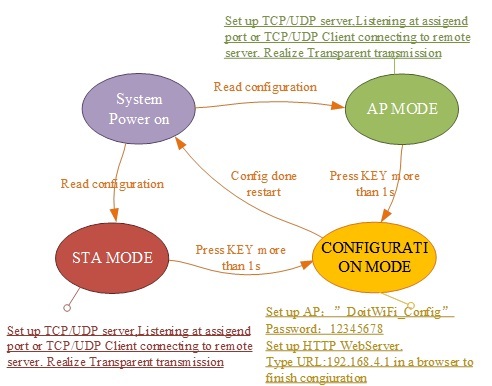 When the serial WiFi shield is in the STA mode, it will always try to connect the specified wireless router till the connection is built or configuration mode is set. Network settings can be set as the server (Server) or the client (Client) mode. WiFi expansion module only supports a Socket at the same time. When “Server” mode is set, "Remote IP" is abandoned. And the listening port number should be filled in "Local Port". When “Client” mode is set, "Remote IP" is enabled. “Remote IP” and “Remote Port” should be filled in. The Serial WiFi shield supports TCP and UDP wireless protocol.